Possibly the saddest casualty of the November 1941 Luftwaffe parachute mine, after the tragic loss of life itself of course, was the wonderful property at 1 Borrowell Lane known as Lord Leycester’s Lodge, shown here in an early 20th century postcard view. The origins of Lord Leycester’s Lodge are somewhat lost in the mists of time. There are some unverified suggestions that it acted as a hunting lodge to the castle itself, but it’s far from clear if this was the case and indeed whether Robert Dudley, Earl of Leicester (circa 1533 to 1588) had any actual connection to it. Nevertheless, the lodge was an elegant timber framed construction with a long history. 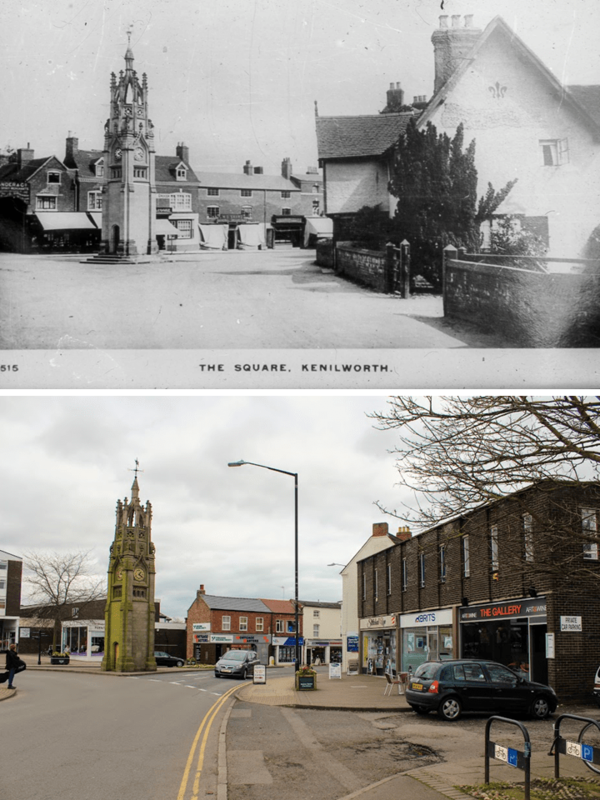 Stephen Wallsgrove’s wonderfully researched book Kenilworth 1086 – 1756 (published by the author, 1991) contains records of deeds of ownership right back to 1581 by a John Brabande. Over the years Stephen records that it was conveyed to new owners along with the Eagle & Child pub situated next door on The Square and subsequently the Green Dragon at Abbey End. Later still the nearby school house on Borrowell Lane and Edwards Charity was set up within grounds owned by the lodge. Also, during its long history it had a malthouse and timber yard within its grounds. A very sorry looking photograph of the shattered remains of the lodge can be seen on Robin Leach’s WWII website, taken through the gutted remnants of the chemist’s shop on the opposite side of the road. John Drew recorded in Kenilworth – A Manor of the King (Pleasaunce Press, 1971) “The middle of Leicester’s Lodge fell in while the writer was standing in front of it. Its walls were still standing and the magnificent porch remained complete”. Eventually it was pulled down altogether. After the war the lodge was replaced in a similar 1950s dark brick, flat roofed style to match the rest of Abbey End. The line of the old driveway seems to have been preserved as vehicular access to the rear of the shops. Several of the premises directly behind the clock tower in the ‘then’ photo survived in a dilapidated state for over a decade before being demolished.